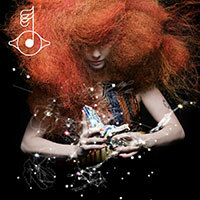 Last week we digitally serviced you “Cosmogony,” Björk’s second single from her upcoming album Biophilia. The track’s subtle, steady bass rhythm provides the heartbeat for an intricate, multi-layered brass melody. Coupled with Björk’s distinct vocals and lyrics, “Cosmogony” paints a picture both primal and etherial. The track’s sparse and haunting production and orchestration evokes a sense of vast, spiritual beauty that harkens back to Bjork’s earlier works. Please report your adds and charts numbers for Björk as the release “Crystalline” / “Cosmogony”.